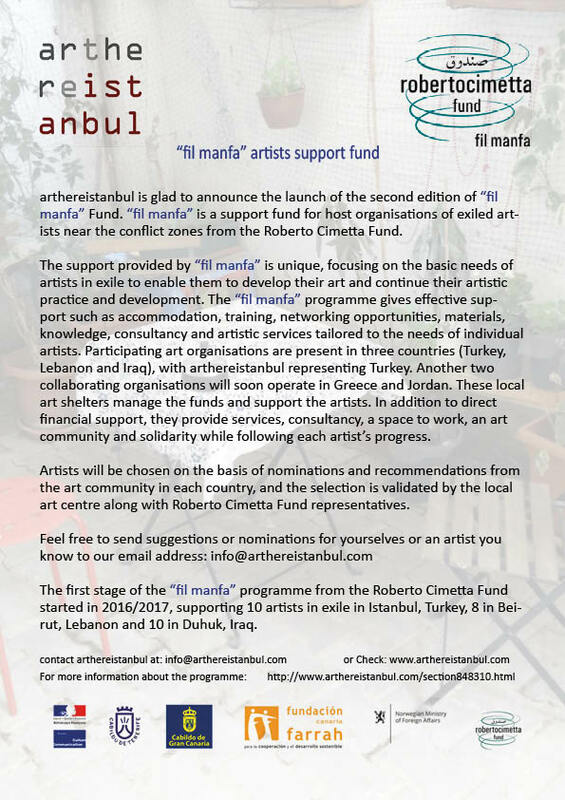 "fil manfa", a solidarity programme run by the Roberto Cimetta Fund, arthereistanbul is the host organization in Turkey. arthereistanbul is glad to announce the launch of the second edition of “fil manfa” Fund 2018 . “fil manfa” is a support fund for host organisations of exiled artists near the conflict zones from the Roberto Cimetta Fund. The support provided by “fil manfa” is unique, focusing on the basic needs of artists in exile to enable them to develop their art and continue their artistic practice and development. The “fil manfa” programme gives effective support such as accommodation, training, networking opportunities, materials, knowledge, consultancy and artistic services tailored to the needs of individual artists. Participating art organisations are present in three countries (Turkey, Lebanon and Iraq), with arthereistanbul representing Turkey. Another two collaborating organisations will soon operate in Greece and Jordan. These local art shelters manage the funds and support the artists. In addition to direct financial support, they provide services, consultancy, a space to work, an art community and solidarity while following each artist’s progress. Artists will be chosen on the basis of nominations and recommendations from the art community in each country, and the selection is validated by the local art centre along with Roberto Cimetta Fund representatives. The first stage of the “fil manfa” programme from the Roberto Cimetta Fund started in 2016/2017, supporting 10 artists in exile in Istanbul, Turkey, 8 in Beirut, Lebanon and 10 in Duhuk, Iraq. We are in contact with many international organizations dedicated to the support and/or protection of artists in danger (ICORN, the network of refuge cities for artists in danger, Protect Defender platform of the European Union that groups together 8 international organizations dedicated to the protection of Human rights defenders, Safe Haven, international network for artists in danger, etc.). We have learnt that many of the initiatives taken in this regard are done so on a global scale, very often concerning areas that are far away from the centre of the conflict. These initiatives don't necessarily respond to the needs of artists who are still on the periphery of those conflict zones. Artists or cultural operators in these peripheral zones are there for various reasons: sometimes because they cannot travel to European countries either because they don’t have access for administrative reasons or because they don’t have enough funds, sometimes because they do not want to leave their region ; they wish to stay in touch with their community and be there when the conflict is over to culturally rebuild things. Through our network, RCF learnt about initiatives taken by artists and cultural operators in the towns close to the conflict zones such as Beirut, Duhok, Istanbul or even Thessaloniki. These initiatives provided shelter, a meeting place, resources, advice for artists in exile. Sometimes they were self-created, sometimes part of an artspace that was already running. RCF decided to suggest to institutional partners a funding mechanism to support the host organization in these peripheral areas providing shelter, a work-space, advice to artists in exile. The support goes to the host organization on an annual basis and an agreement is signed with RCF. The beneficiaries of these host organizations, ie the artists in exile, are chosen by the RCF Board and Committee of experts as well as the host organizations’ managers, based on specific criteria. Artists can be hosted for 3 to 6 months and special attention will be paid to help the artist or cultural operator to find a suitable transition after his or her stay. Hosting can be total (accommodation, working space, advice) or partial depending on the situation of each artist or cultural operator. To date three organizations are host of the Fil Manfa programme. They are based in Istanbul, Duhok and Beirut. The programme was launched end of 2016/beginning of 2017.